The biggest news yesterday at Apple’s iPhone announcement has arguably been the iPhone 4S and the distinct lack of an iPhone 5, but what about changes to the iPod range? Well, it looks like none of the models are being axed quite yet (as was rumoured last week) as Phil Schiller said last night, “I’m really pleased to talk to you about the iPod. We love music, and we’re still making great iPods”. 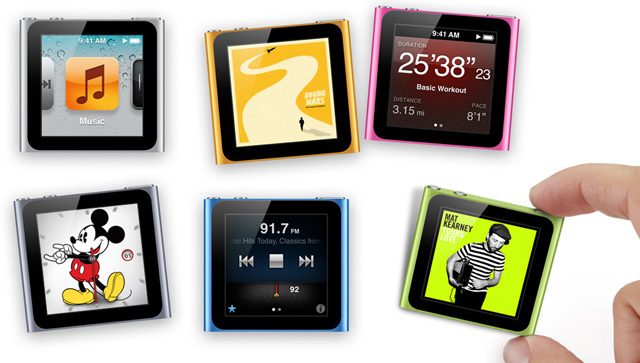 In fact, there’s even going to be new versions of the iPod Nano AND the iPod Touch. The new iPod Nano range (pictured above) features a lot of shiny, colourful devices that aren’t just about the music, there’s Nike+ integration, multi-touch gestures just like Apple’s other devices, FM radio and a range of different clock faces making your watch redundant. Now although the device hasn’t been completely overhauled, I do really like the way it looks and the new roles it’s trying to fullfil. Colours: Silver, Grey, Blue, Green, Yellow, Pink, Red. Price: £115 for 8GB, £129 for 16GB. 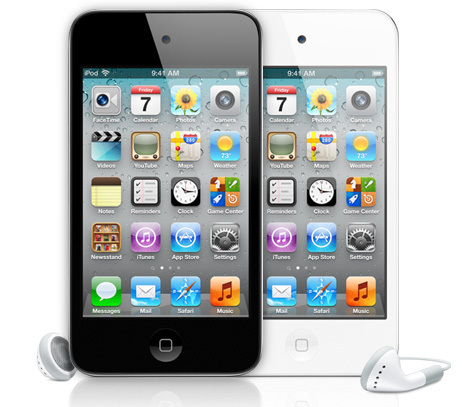 A new iPod Touch device will launch that’ll be available in both black and white. It’ll run iOS5, which means you’ll have access to all of the new goodies, like Twitter integration, Safari’s new Reader feature and most importantly iMessage. Like the Nano it’ll have built-in Nike+ support, as well as HD video playback, FaceTime and a much slimmer, sleeker design. Price: £169 for 8GB, £249 for 32GB and £329 for 64GB. Well, it looks like none of the models are being axed quite yet (as was rumored last week) as Phil Schiller said last night, “I’m really pleased to talk to you about the iPod. Can’t wait till iPod touch 5 comes out. Definitely buying!